I looked back over my FB messages to see when Zander Ross messaged me to sign up for the JFK50 even though I never run an ultra, it was April 23rd. I am extremely susceptible to suggestion and signed up. I spend the summer running in New Mexico, nothing crazy but making sure I did a medium run, 1.5 hours give or take on a rolling dirt bike path Saturday and 3 hours or so on Sunday in the mountains. I hit up every ultra friend I had for advice because until then I mostly only heard about vomiting, diarrhea, bonking or falling and inflicting some terrible injury. I did not want any of that to happen to me. I continued my training through the fall, getting help from Coach Owen Anderson for the final eight weeks. 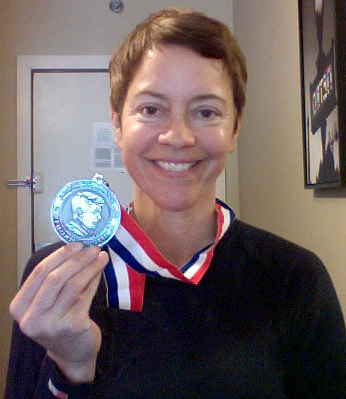 I only ran one race in the Fall, the Big Cottonwood half marathon in Salt Lake City with a personal best of 1:34. I rode to Maryland with four of my Front Runner buddies catching up on all the gossip as I had not seen any of them in over a year, since I changed clubs to run with the Dashing Whippets Racing Team. They had all run JFK50 and knew the course telling me what to expect. Tim who was not running this year crewed which was a huge mental boost. I had no idea what shoes to wear, I was told the first 15 miles on the trail had big, sharp pointed rocks covered by leaves. Since I always have foot pain and did not want to break any bones I played it safe with my La Sportiva Helios which have excellent grip but are still light. I quickly fell in with a group of runner as we negotiated the single track. It was slow and I wished I had done training on quick footing and agility, it would have made a huge difference on this terrain. Toward the last 4 miles of the trail section I fell in with 5 women and we grooved through the last stretch. It was a rarity to be in a pack of women at a race and it made it extra fun. I emerged from the trail and saw Tim right. He had my bag with my Saucony Fastwitch shoes and Injinj socks. It felt so good to change my shoes and socks and get rid of my hat. Tim helping me with my chip, giving me a big hug and sending me on my way. I found after the trail my cadence was high but my stride length was dismal. I played around with trying to get my knees up to doing a fast shuffle as I entered the flat tow path section. I alternated jog / walk which I saw everyone else doing. At a certain point around mile 23 I though what if I just run faster and see how I feel. I felt so much better, fast is all relative because it was only around a 9:00 pace. As I got closer to mile 30 I had a stabbing pain in the outside of my right knee and the walking became longer and jogging shorter. (the pain had started developing much earlier, perhaps around mile 20 but did not affect me too much yet). I had not planned for mechanical error and wished I had brought duct or KT tape to plaster my patella down and stretch my IT band. I asked for tape at the aid station and there just happen to be an ambulance that had stopped to chat. The did a super job of wrapping me all up with a nice hot pink band and I was back on my way. A little something about the aid stations.There are 14 in total and they have everything you need. There is no need to carry supplies except for maybe a handheld water bottle. I carried and ate dates and papaya and grabbed a couple handfuls of potato chips and three cups of hot soup broth. I also took Hammer Electrolytes. One aid station was all decked out like Santa’s village filled with Christmas cookies, lights, and Santa himself. Every station had water, Gatorade, oranges, bananas, potato chips, PV&J sandwiches, many had boiled potatoes, soup, hot chocolate, gummy bears, m&m’s, cookies, coke, power bars, electrolytes and more. Because of my slow pace and wanting to finish as fast as possible I never stopped at aid stations, I grabbed what I needed, usually water, thanked them and kept going. By the last tow path aid station, mile 41 I was power walking 100%, not because I was tired but because my knee hurt so bad if I ran, no pain with walking. A group of volunteers where there to put orange reflective vest on us before we hit the open road for the final stretch. I tried to run the road but it was not going to happen, my knee wanted none of it. I passed a young really strong looking man with a very painful looking walk, he told me he wore the wrong shoes and his feet were a bloody blistery mess. I soon passed two more young guys crawling up the hill who were in total exhaustion. I came to the 8 mile sign. The road was rolling hills and would have been a beautiful run. I was full of energy and a bit frustrated that I could only power walk. I was calculating my time and figured I could easily finish in about 70 minutes if I could run slow, but after trying a couple times I knew I could only power walk so I did it with a vengeance. It was remarkable how many people I passed. We would pass each other back and forth as they run / walked. I thought of the tortoise and the hare, clearly I was a tortoise but more often than not, I would be the one who continued as they stopped. I huge reward was catching up to a man I met the night before, it was his 32nd time running the JFK50. What a hero, he said he planned on running 35 and that would be it. There were a large number of runners in the 70’s and talk about inspiring! At mile 5 I passes a woman maybe in her early 20’s. A friend came out to run her in, she seemed really down. Her friend was talking her back up, saying you just have to finish the last four miles in an hour, and I was thinking good god an hour to finish 4 miles, I need to step up my power walk and get this done. I was trying to keep it as close to 12:00 pace as possible. I stayed optimistic the whole race, I never had a doubt, I never went to a bad place, nor did I vomit, dry heave, poop my pants or have any other ugly stuff. From the first day I signed up I said, no matter what it would be like a long day of hiking and I just wanted to finish within the cut off. But in those last couple of miles I thought that this is so stupid, I am only a couple miles away and I am walking. I am walking as fast as I can but I want to run, I did not come out to walk this, couldn’t anyone do that? Well probably not and it was not to beat myself up, but all my muscles felt good, my energy stayed even, I was happy, but my right knee / IT was not cooperating and that was frustrating. At the four mile mark we came to an intersection. There were loads of people cheering in the 35 degree cold. People were saying, “thank you for running our race,” “thank you for running through our town,” “Hilary you have just 4 miles, 4 and your are done, you got it.” At several points along the way, I would hear “Hilary you look great” “Hilary great job.” The spectators would bring out the printed race program, quick look up our number so they could learn our name and call it out. Talk about dedicated support! At every step of the race I felt as if I was wrapped in a blanket of love. In the last half mile as I entered the town emerging from the dark was my friend Tim. What a sight at this 10+ hour mark. He talked to me as I power walked my last bits. 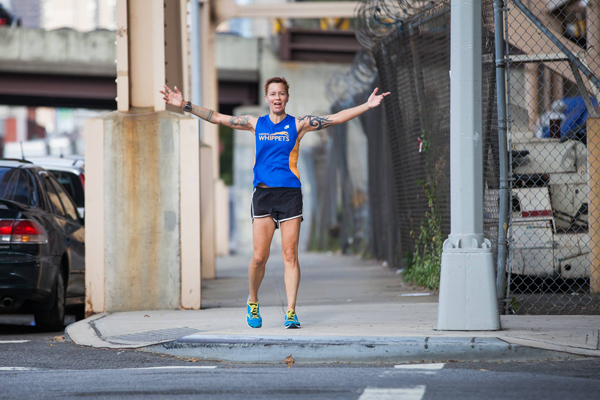 I chatted as I felt my hip flexors start asking, “are we done yet?” We turned the corner and Tim dropped to the side telling me to, “go get your glory.” At the top of the little hill there were huge bright lights and I hear, “Hilary Lorenz from New York City, congratulations” over the loud speaker. Suddenly my face contorts all up as I try not to cry. I look to the ground because I know it is being televised and I did not want to break down sobbing before I hit the mat. I did not expect that to happen. I had no strong emotions during my time out out there, I just thought it was fun. I crossed the mat and a man said, “you can stop now.” My power walk was in stuck gear and I had I had to be told to stop. A women pulled off my orange vest, another gave me a medal. I started walking away and Tim was there to see that I returned my chip from my shoe. I had not, I did not see where to do it. He took it off me, laced my shoe back up and we went into the warm gym. There Zander and Richard were, the arrived about 30 minutes ahead of me. We ate pizza and hot chocolate. I was shaking uncontrollably from the cold. I had shorts on and while the day was perfect from about 38 to 46 it was now down to about 35 degrees, dark and very windy. I had a terrible time trying to stir my hot chocolate because I was shaking too hard. After some food, and smiles all around, big laughs and congratulations to each other and to those we came in with it was time to walk the 3/4 mile to the car. Oh dear god it hurt. My hip flexors stopped working and I could not pick up my feet, my entire body was convulsing from the cold. I hung on Richard’s arm like a 115 year old woman. People coming to pick up friend and family were saying, “congratulations” and I could not even respond I was so mentally focused and getting to the parking lot which I could not even see it was so far away. But once in the car with the heat on and the 30 minute drive back to the hotel my legs relaxed and I was able to walk again. I took a really hot bath, put on sweats, made hot miso soup and climbed into bed. Finally I was warmed up, walking fine and feeling good. The boys, seven in total from our group went out to drink margarita’s which I took a pass on to watch HBO and enjoy the kindsize bed without my two Labradors taking up all the space. I slept great that night waking up Sunday feeling good. The right side of my knee still aches. I taped it up which made all the difference. I met the all the guys at breakfast and heard their great stories, everyone was successful. One friend, Steven will be running Lookout Mountain 50 miler in three weeks, he did awesome at JFK running it under 7.5 hours. I certainly hit my goal of finishing. I also hit my goal of qualifying the the Overland Track 82k Race in Tasmania and Western States 100 for 2014 lottery, now over. However the JFK50 will no longer be a qualifier in 2015 and at this point I do no want to run 100 miles. It is just nice to know that I can qualify. I still have a weird conflict about the amount of walking, but it is what it is. Will I do this again? Absolutely. It is really fun, I know that is hard to believe but it is. I can easily take one hour off my time as long as I can avoid mechanical errors and I plan to do this by working my posterior chain for the next year, taking the stress of my hip flexors and IT band and doing agility work. But I am so thankful to the many many people that helped me, this was a very rewarding day and now I am going to convince other friends to join me next year. Monday as I get ready to go to work, I will feel as if I was wrapped in that blanket of love. After months of training the weekend finally arrived that I will run my first 50 mile race on Saturday November 23rd. I had three great months of running in New Mexico with the Santa Fe Striders over the summer, nice trails, great mountains, heat and altitude all rolled into one. I have been in NYC for the past three months, putting in plenty of 20 miles runs, a few 25’s and a 30, tonight I just had a handful of 400m intervals, but almost all on pavement. The picture above is from the Blue Line Run done a couple weeks before the NYC marathon and along the same course. I signed up for the the JFK50 back in April through the urging of my friends Zander and Richard, at least that is how I remembered it, and together we will run it. Zander has run loads of 50s and both Zander and Richard have run over 100 marathons each! Despite their vastly superior experience I think we will be a good match physiologically to run this whole thing together. I called on many ultra runner experienced friends, Joe, Michelle, Gabrielle, Hideki, Tim and in the final 8 weeks Coach Owen Anderson. I had used Coach Anderson’s 30 days to a marathon finish plan for both a marathon and a half and PR’d both like crazy so I thought he could be me to the starting line fit and quick footed. Joe, Michelle, Gabrielle, Hideki and Tim provided me with a huge amount of information on eating and their GPS data, this was really crucial. I am not afraid to cover 50 miles, my only concern is making myself eat which is a constant problem. My pack is filled with dates, figs, bars and a couple emergency gels. 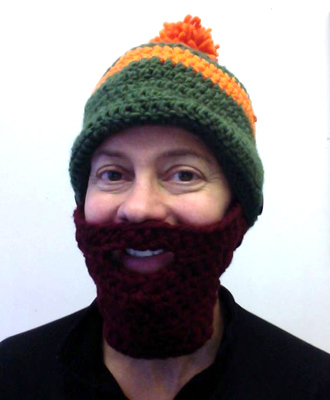 But the best weapon I have in my back of tricks is my new beard hat! This awesome baby was hand crochet by my student Ruth. Yes it is warm, but it also makes me feel all fuzzy and happy inside and that happiness is what is going to carry me across the finish line with a smile! Appalachian Trail and runs for 14 miles, then a gravel/dirt tow path for just over 26 and finally a road. The trail is technical and rocky and of course be slower, but I think they is a good way to start. I want to finish until 10 hours but honestly I have no clue what to expect, I just ran a 1:34 half marathon on September at altitude, but it was also a lot of downhill and on road. So here is to new adventures. Wish me luck!